Join your expert Lakani Tour Manager and an exclusive group of like-minded travelers on this spectacular tour of India, Nepal, & Bhutan. 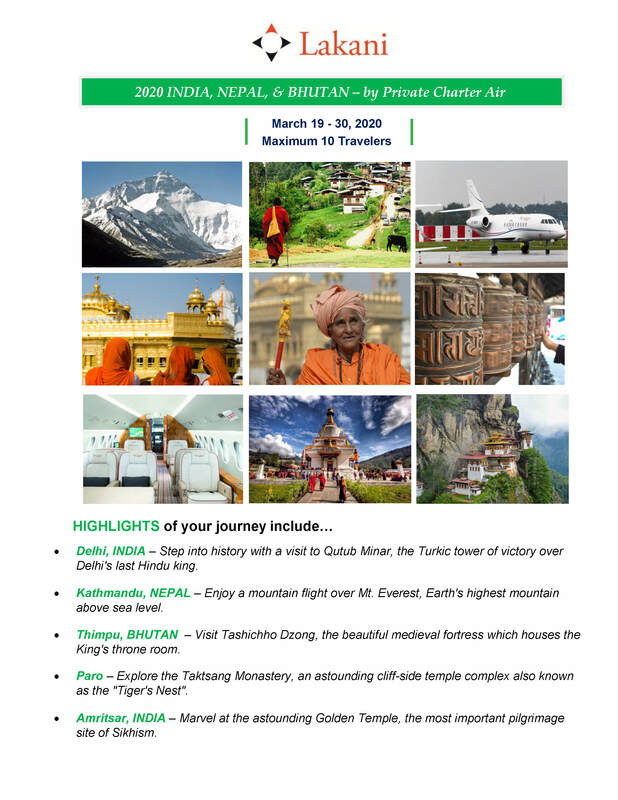 Discover the vibrant colors, fantastic temples, majestic mountains, and spiritual culture of India, Nepal, & Bhutan on an extraordinary journey. Traveling by private charter air allows you optimal time for sightseeing in each place. Accompanied by expert Lakani Tour Manager, this adventure promises to be life changing and unforgettable. Sep into history with a visit to Qutub Minar, the Turkic tower of victory over Delhi’s last Hindu king. Enjoy a mountain flight over Mt Everest, Earth’s highest mountain above sea level. Visit Tashichho Dzong, the beautiful medieval fortress which houses the King’s throne room. Explore the Taktsang Monastery, an aoutstanding cliff-side temple complex also known as the “Tiger’s Nest”. Marvel at the astounding Golden Temple, the most important pilgrimage site of Sikhism. 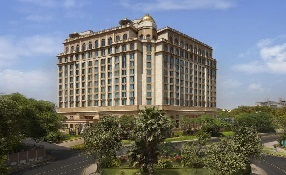 Arrive in Delhi where you will be met and transferred to your luxury hotel. 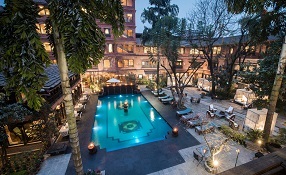 Today we board our private charter plane to the Himalayan wonder of Kathmandu in Nepal. Flight-see around Mount Everest and meet a noted mountaineer who conquered the climb. Visit Nepalese holy sites including the amazing Swayambhunath Stupa, Pashupatinath Temple, Boudhanath Stupa and more. 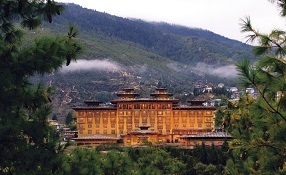 Fly by private charter to the magical Kingdom of Bhutan, where success is measured in happiness. Tour the enriching National Memorial Chorten, beautiful Tashichho Dzong medieval fortress, Buddhist monasteries, and Dzongs. Visit the renowned School of Arts and Crafts to watch students create Bhutanese masterpieces on cloth. Drive through the high mountain countryside to Paro, enroute visiting the incredible cultural collections at the National Museum. Hike to the sacred and awe-inspiring Taktshang Monastery, ‘Tigers Nest,’ a jewel overlooking the Paro Valley. Enjoy a lesson in archery, the national sport, and experience a blessing by the Chief Monk at Kyichu Lhakhang Temple. Delight in a colorful Bhutanese Folk Dance performance. Fly in our charter aircraft to northern India and the mystical city of Amritsar. 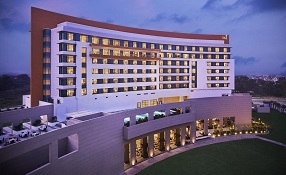 Bask in the glory of the massive Golden Temple – famed Sikh pilgrimage site. The pure gold leaf dome glows in the morning sun and is reflected in the holy waters of the temple pool. Return to Delhi by charter aircraft for an afternoon at leisure before boarding your late evening flight home or to your next destination. Beautifully decorated with traditional woodwork. Nestled in the heart of Thimphu Valley. 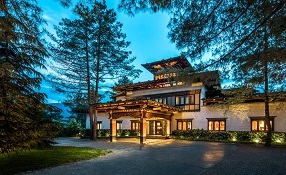 The most exclusive private villas in Bhutan. Fusing modern design with traditional elegance.